Going by reputation, one would imagine Terrence Malick to be an imposing, almost mythic figure – the J.D. Salinger, Thomas Pynchon, or Bill Watterson of cinema – an artist whose personal reclusiveness and daunting legacy have, in tandem, produced a legend and folklore among cineastes and artists around the world. As the 72-year-old filmmaker sidled calmly into the Princeton Garden Theater last Friday evening – balding, grey-haired, dressed in a beige-white suit and keenly observed by an audience of dozens of fans and locals, as well as his wife, Alexandra Wallace – it was hard not to let such lofty expectations instantly disintegrate. Malick proves incredibly humble and soft-spoken – the embodiment of southern etiquette and decorum. Hearing him speak – only when prompted, slightly stammering, and frequently in the form of intimate personal anecdotes – the reason for his legendary aversion to the public eye is both entirely clear and beautifully simple: he is a shy man, an earnest introvert, and one who does not place great value in saying more than needs to be said. His words are simple, yet deliberately chosen; his handshake warm and gentle, yet subtly firm. He does not carry about any great sense of cosmic import in himself or even in his works. (In a fanboy moment, I expressed my admiration for his willingness to nakedly approach such lofty topics as the fabric of memory, the character of nature, and man’s relationship with God. His response: “Well, I don’t know about all that…”) In his presence, rumors and myths slip casually away to reveal only a man who cares deeply for cinema. Invited to speak as part of a film series hosted by Princeton University at the Princeton Garden Theater, Malick miraculously agreed to attend a brief discussion and Q&A following a screening of Roberto Rosellini’s 1954 classic drama, Journey to Italy – itself a work of deceptive simplicity. Malick did not attend the screening proper. He was, in the words of the moderator, enjoying “a leisurely stroll around campus” at the nearby university, presumably in spite of the uncharacteristic late-October humidity and looming threat of rain. Photography and recording equipment were strictly forbidden at the venue, although this seemed to be enforced on a strictly honor-system basis – phones were not collected or confiscated, and security was light at best. If no photos, video, or audio of the event surface online in the coming days, it will be a testament to the decency of the entire audience in respecting the privacy of a private man. The dialogue with Malick primarily covered two subjects: his thoughts on Rossellini’s picture, and his thoughts on the current age of digital cinema. 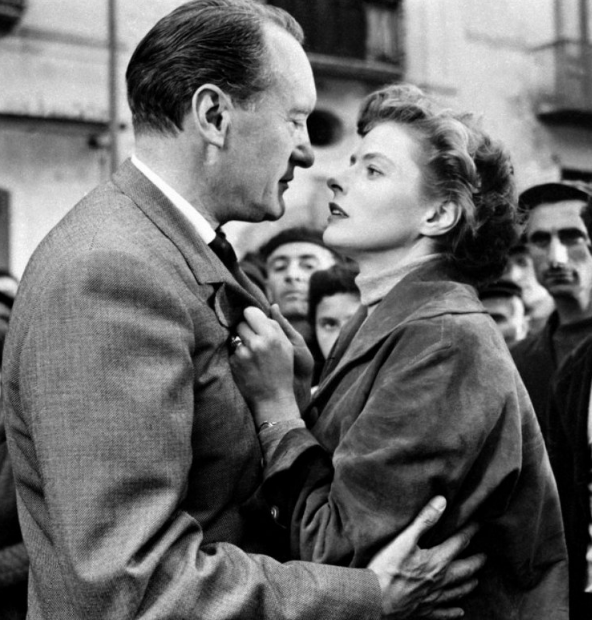 On the former, he expressed a longstanding admiration for its naturalism – it does not so much seem scripted, he says, as it does a matter of the camera, an invisible watcher, following Ingrid Bergman’s and George Sanders’ characters through an episodic series of encounters. He likened the revolutionary simplicity of Rossellini’s style and production to Jean-Luc Godard’s quip that all one really needs to make an interesting film is one man, one woman, and a car – these being quite literally Journey to Italy‘s core ingredients. He also said that the sense of spontaneity captured has been an inspiration for his own work, including the famous tendency to capture moments of natural beauty on the spot and work them into the fold. Malick is also interested in its complex and ambiguous portrayal of a frayed marriage — one wrought by mutual alienation and habitual failure to communicate, leading to an unexpected resolution that has divided audiences for decades. Malick recalled his changing emotional responses over the years after first seeing Rossellini’s work as a student – and rarely since. He feels Journey‘s thematic content is more relevant now than ever, even citing Sherry Turkle’s popular 2011 nonfiction book Alone Together as documentation of a new breed of alienation and emotional challenges unique to our age, as well as the perils of digital technology. Dovetailing into the other primary topic, Malick expressed deeply mixed feelings about the age of digital cinema and the increasingly accessible technology that comes with it. On the one hand, he indicated great enthusiasm for the capacity of cheap and easily available HD cameras to democratize the form, making entry into image-making almost as easy as writing. Likewise, he’s taken an interest in the opportunity for new images and movements that can be captured by digital equipment, specifically naming the GoPro camera used for certain sequences in Knight of Cups. At the same time, he was adamant about the unique and irreplaceable power of the big screen to realize cinema’s full capacity – something he fears may be threatened by the propagation of handheld, digital video-playing devices and home theaters. This, in fact, is the exact reason why Malick has so infrequently revisited the work of the early greats who inspired him in film school. Journey to Italy was cited as a specific example: watching it at home or even on a portable device, one could “witness the shots, memorize the dialogue,” and yet, without experiencing it on the big screen, he feels a crucial element would be lost. Regarding scripts, he acknowledged the stylistic difference between his early pictures and more recent work. Malick worked as a screenwriter before becoming a director, and his early directorial efforts were tightly written. He’d cut no more than one or two scenes in his “first film,” though it was not specified whether this is in reference to his 1973 feature debut, Badlands, or a shorter prior production. In contrast, Malick’s more recent works have rather notoriously adopted a more improvisational, stream-of-consciousness style, with dialogue kept to a minimum in favor of voiceover, scenes edited together in montage-like fashion, and huge swaths of footage left on the cutting-room floor. While the director has enjoyed the freedom that comes from this mode of production, he claims to be gravitating back toward working with clear scripts and pre-planned productions. (He recently finished shooting his WWII drama, Radegund, in Europe.) Malick does not see this as an imposition on his creativity, but, in fact, a better enabling factor: it is easier and more productive to go off the rails, he says, when rails are in place to begin with. While Malick shared plenty on the main topics of the evening, what stood out most to me were the personal accounts, which quietly but vividly illustrated his unique love affair and inspiring passion for cinema. He described regular, present-day experiences of watching movies with his wife – whether classics on (“to our shame”) a portable Blu-Ray player, or ventures to the local multiplex. (Smokin’ Aces was a surprise favorite – “very well directed,” he said, and showcasing an impressive ability to balance multiple plotlines.) Most affecting to me were descriptions of childhood memories of going as often as possible to his local theater in Oklahoma, with each viewing inspiring the young Malick to “make vows” – to be a more loving son, a more just person, or any other moral and personal mission that each new title might provoke in him. Though the vows would inevitably be forgotten “in about five months’ time,” the cumulative personal impact remained — as, I imagine, the rare experience of meeting a living legend will for me and the other fans in attendance. For an artist who produced four features in the first four decades of his career – and spent two of those decades completely withdrawn from the public eye – Malick’s sudden reappearance and newly prolific output has come as a shock to many. (He has directed more films in the 2010s than he’d made prior to that point since the early 1970s.) The great irony, of course, is the casual realization that Legendary Filmmaker Terrence Malick loves and lives the experience of cinema just like the rest of us. It is easy to apply a Salinger-esque air of mystery, but to the audience in attendance, the reason for his famed elusiveness likely became rapidly clear: Terrence Malick is, quite simply, a shy man. He seemed surprised and humbled when several audience members, including myself, approached him briefly to express the impact his work has had on their careers and their lives. While he did not share any details at the event of when and where he might next emerge in public, with luck, Malick may deem this kind of intimate venue an experience worth repeating.